Pokémon Go can get you killed, and the Japanese government wants players to protect themselves from the worst-case scenario. When the game launched in Japan on Friday, the government’s National Center of Incident Readiness and Strategy for Cybersecurity (NISC) issued public safety tips to keep people from dying or getting into other trouble while playing the popular smartphone game. 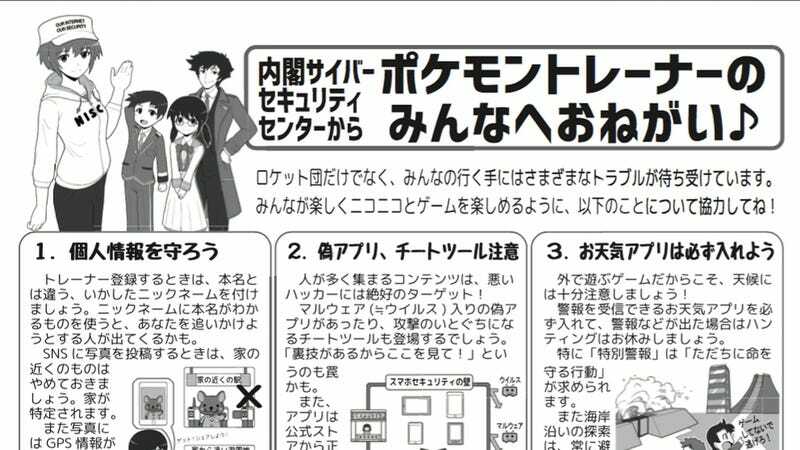 The tips are pretty sensible: The government recommends that people use a nickname that cannot be used to identify them in real life, to beware of phishing apps that look like official Pokémon merchandise, be mindful of the weather and heatstroke when out catching Pokémon, carry an extra battery, carry a phone card, and of course, not to enter dangerous areas or meet with random people. Pokémon Go has only been out for a couple of weeks, and already, there are dozens of stories about people being far too engulfed in the hunt for more monsters. Some think it’s part of Satan’s master plan, but more sensible people would say it’s just a matter of players being more aware of their surroundings while playing the game.